Sam and Esther Kawata have been together for 72 years. “We hold hands to support each other,” Esther says. 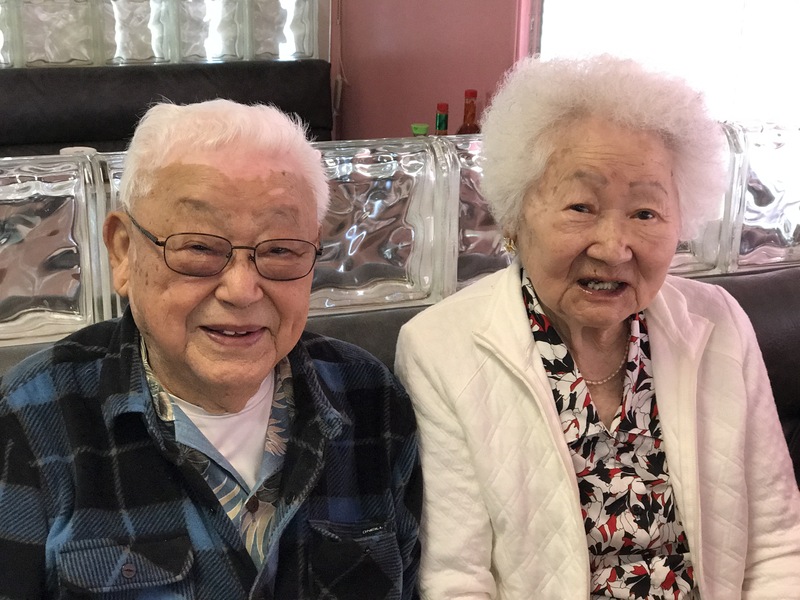 In a world where promises can be empty and divorce is common, what an inspiration it was to chat with (quite possibly) the Japanese American community’s longest-married couple. Sam and Esther Kawata promised to spend a lifetime together, and for 72 years, they have done just that. This Valentine’s Day, I asked them to share their decades of marital wisdom and experience to help all of us younger married couples. They said the secret to their long-lasting marriage is pretty simple. The Culver City couple, who are now 96 and 94 respectively, were married on Dec. 3, 1944 in Colorado. Sam was raised in Baldwin Park, Calif., but moved to Colorado during the evacuation around 1941-1942. Esther was born in Colorado, where her family owned a 400-acre farm. They grew cantaloupe, onions, sugar beets, barley, and wheat. Sam answered: (1) Love each other; (2) Christian living, i.e., got to believe in God; and (3) It helps to have strong family ties. “Our daughter calls us every day, once in the morning and once at night. She also drives down from Simi Valley to Culver City almost every day,” said Sam. Sam also stays active in community events and has served as an officer of the Seinan Senior Center for many years. At 96 years of age, Sam is still “sharp as a tack.” He said, “It’s never too late to learn something new.” Sam recently joined the Karaoke Club at the Seinan Senior Center, where he learns to sing Japanese songs translated into English. “I really enjoy it,” says Sam. If you would like to join Sam singing Japanese karaoke songs, Sam says, “Anyone is welcome.” The Karaoke Club meets every Monday and Friday at the Seinan Senior Center in the Crenshaw district. For more information, call (323) 734-2175. Congratulations Uncle Sam and aunt ester. You have a beautiful story. God bless you both. Love in Christ john and carol iwakiri Johnston.